Last week, I teamed up with Vanessa of Style By Ohaha to create a simple but delicious meal that anyone and I mean anyone can pull off. And while we prepped and stuff, we had a light but great conversation and for the moment, I missed my friends as they don’t stay in the same state as I. It’s a vision of mine to be able to have light convos over a good meal and a glass of wine some day. And I really missed gisting with Seki while ‘forcing’ her to cut vegetables at my kitchen table (inside joke). Something about cooking that I love is the process and for me, it reminds me of the way life progresses. It’s a journey. From the raw ingredients being purchased at the local market or store, to being washed and prepared, to being put together with oils and spices via whatever cooking process chosen and some minutes later, a whole meal ready to be shared is made. Life is a journey, so make sure you enjoy it every step of the way. Learn to enjoy the highs and the lows because honestly, life gets dull with only highs. Be kind, don’t use the safety of the screen/ internet to bully people. This has been increasing at an alarming rate recently especially on the streets of twitter. See what I said about it here. Vegetables can be fun and delicious! 1. Chop chicken into bits and marinate. 2. Wash and boil rice. Drain, set aside. 3. Wash and chop vegetables. 4. Lightly grease wok and fry chicken till done. 5. Take out chicken and set to stand in a bowl. 6. Toss broccoli and green beans for about 3 mins. 7. Pour in chicken stock, boil vegetables for 2 mins on high heat. 8. Add in carrots, chicken and peppers. Cook for 2 minutes. 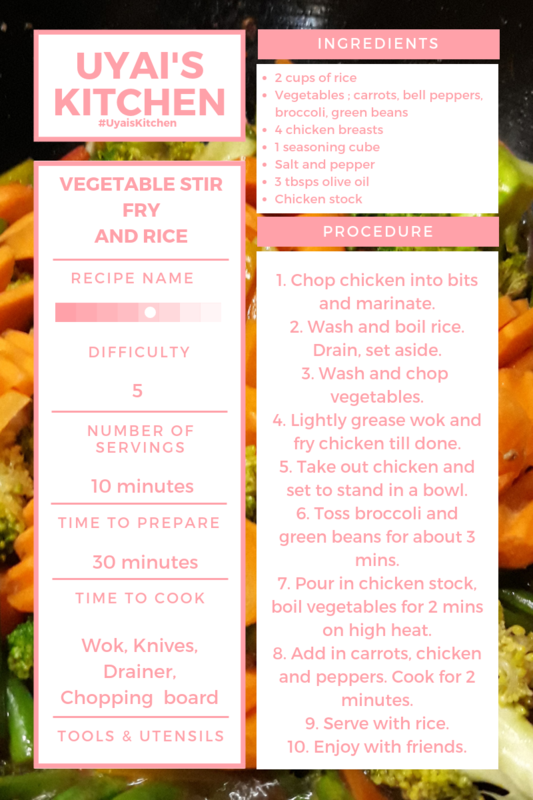 To make it easy, I’ve created a recipe card ready for download and quick access. If you ever try this recipe, please use the hashtag #UyaisKitchen on instagram or twitter to keep me in the loop and share what you’ve created. Cheers to a wonderful and long lasting weekend!